Today about 20 KMG Japan students had their P1 and P2 test (1st and 2nd level) in Tokyo. The test was 3h30 minutes long during that time students had to demonstrate their knowledge and skill to execute the techniques of P1 or P2 level. 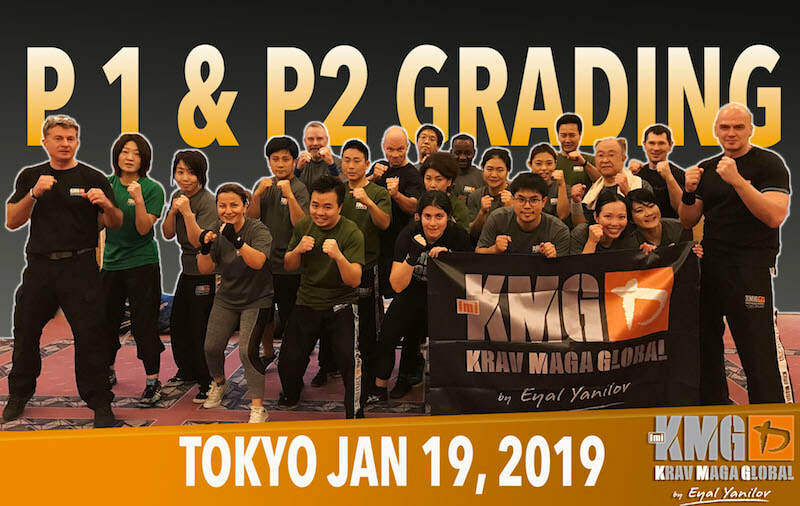 Passing grades is very important to progress in Krav Maga, because it forces students to memorize the technics and practice them as well as they can in order to pass their test. 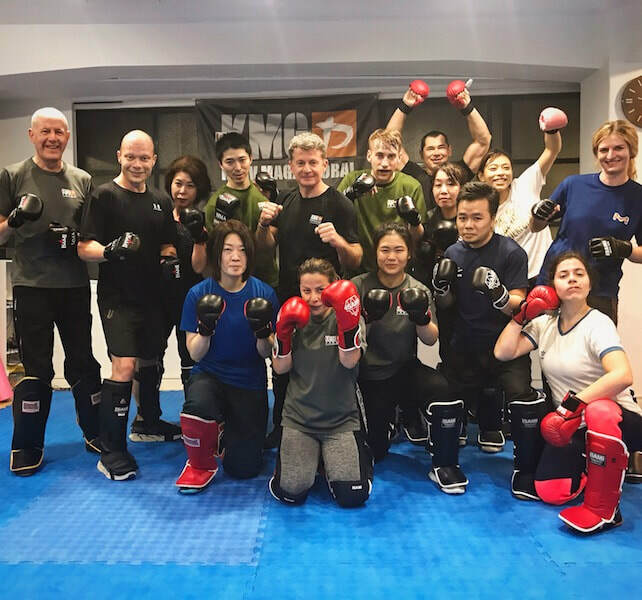 In Krav Maga (KMG) we have 5 degrees in Practitioner Level (P1 to P5), 5 degrees in Graduate Level (G1 to G5) and 5 degrees in Expert Level (E1 to E5). the next level after E5 is Master. It takes about 3 years of regular training to reach G1 and about 3 to 4 more years to reach E1. 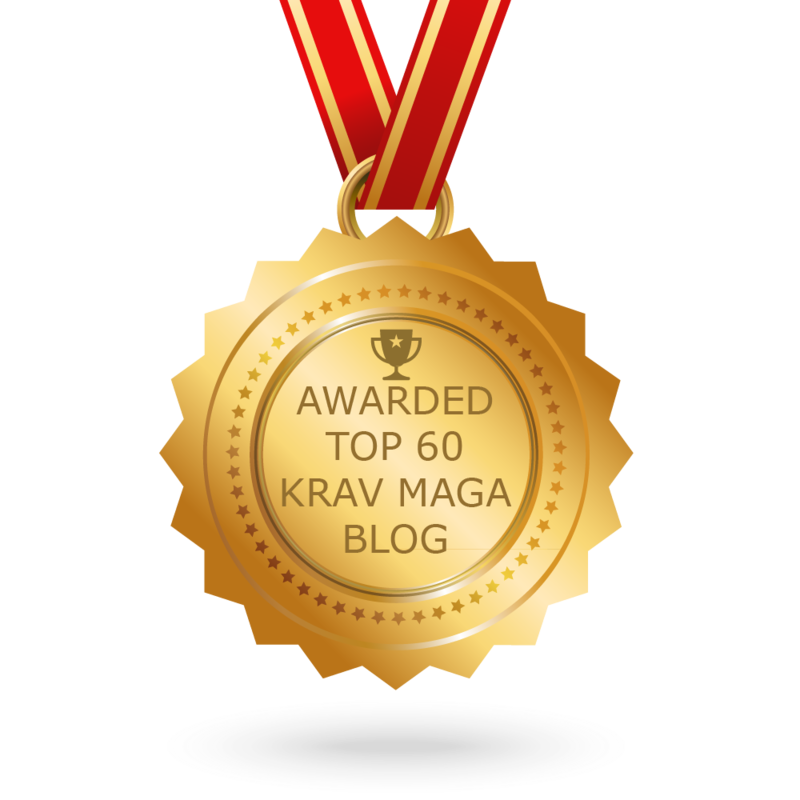 So after 7 years of regular training and dedication to Krav Maga one can become Krav Maga Expert. It is a journey sometime hard but very rewarding. Krav Maga is a way of life. 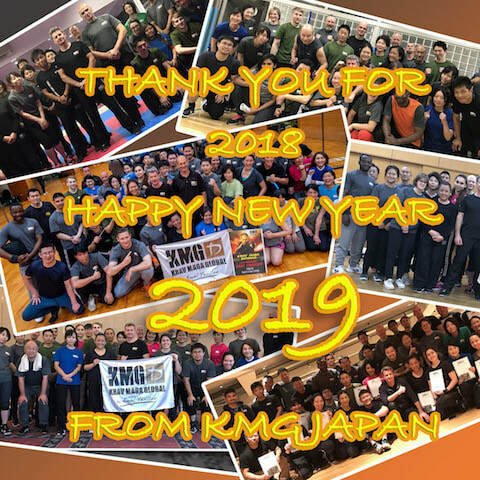 Thank you for choosing KMG Japan as your favorite place to learn Krav Maga and thank you for following us and for supporting what we do. We wish you Health and Happiness for 2019! HAPPY NEW YEAR! 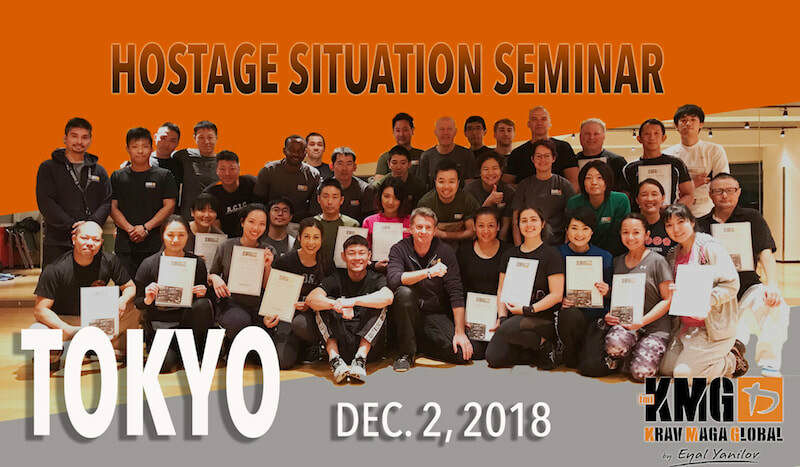 Sunday Dec. 2, we conducted the Hostage Situation Seminar in Tokyo. The idea of this seminar was to give participants a little understanding about what can be done technically and tactically is such situation and, of course, to have good time while learning some useful stuff. The Seminar was conducted by Edwin Peng who is a military Krav Maga specialist from KMG. It was a very exiting seminar with a lot of action and everybody had a lot of fun. Thank you to all the participants! 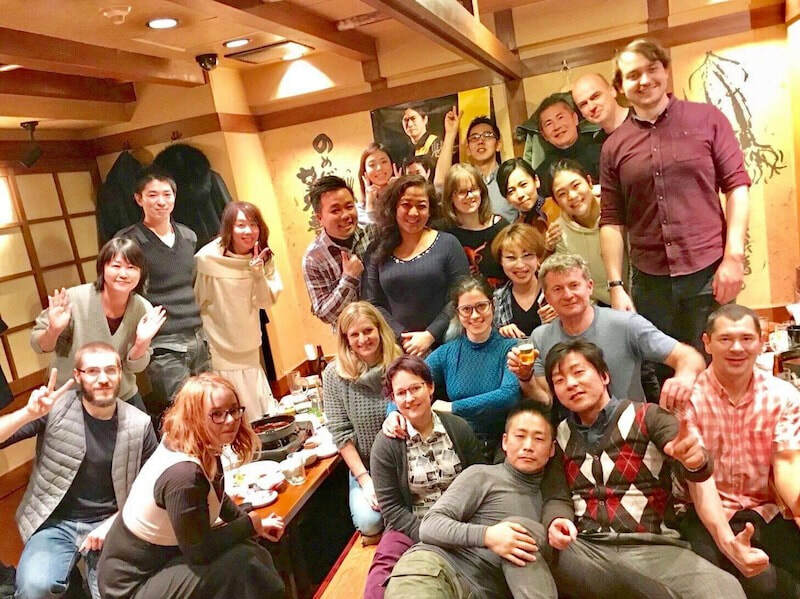 Saturday evening was the Practitioner review seminar hold in Nakameguro (Tokyo). 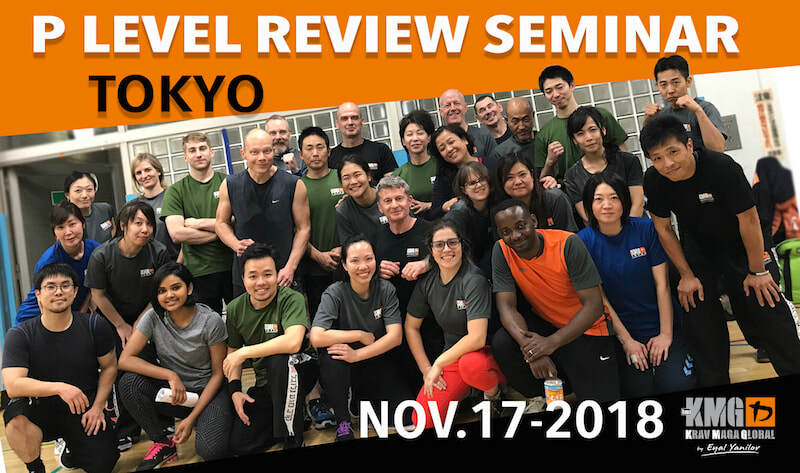 This seminar is specifically meant to prepare each participant to review their Krav Maga curriculum in respect to their current level and hence prepare for the next level grading. Great group of participant, excellent instructors and wonderful atmosphere. Little training outside on Sunday, working on defending punches.